The Sawtooth National Recreation Area will hold a series of open houses next week to discuss a planned system of 36 miles of new hiking, biking and horse-riding trails in the Galena Lodge area. The open houses will be held Tuesday, Aug. 7, at 5 p.m. at the Community Campus in Hailey and on Thursday, Aug. 9, at 5 p.m. at the Wood River Y in Ketchum. Public comment will be accepted and encouraged. SNRA Recreation Specialist Ed Cannady said the plan includes many beginner and intermediate-level trails, in an attempt to supplement the area's current offerings. "Right now, we're providing a lot for more experienced users," he said. "We have lots of trails for more advanced users, but we have few trails for beginners." Cannady pointed to the Gladiator Creek and Galena Grinder trails as ones that are not suitable for the casual user. Fees are charged to ski on the groomed trails in the winter, but use of the trails in the summer is free. The trail system is proposed for summer use only, and will also involve an overhaul of 24 miles of existing trails. Cannady said the goal is to create a trail system with varied degrees of difficulty that is also self-sustaining—meaning crews won't regularly need to go through and maintain drainage. Many of the current trails are former mining roads or trails built by the Civilian Conservation Corps, which are not conducive to hiking or even long-term use. 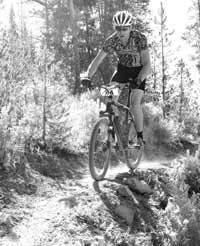 "A lot of those trails weren't built with backpackers in mind, they were built with horses in mind," Cannady said, adding that water bars were the main form of drainage on these older trails. A water bar is an angled channel across a road or trail that diverts surface water from the trail and into an adjoining drainage ditch. However, Cannady said that on a truly well-designed trail, water bars would not be necessary. He said the Forest Service prefers to use rolling terrain and other more natural features to ensure proper drainage. "If the water is running down your trail, it's not good and it's not going to work," he said. The plan will include a few advanced trails. The system was developed as part of the Sawtooth National Forest management plan, which designates the area around Galena Lodge as an area that should be managed with an emphasis on recreation rather than habitat improvement or preservation. Cannady said he looks forward to hearing from the public during the open houses. "We have the potential to develop a world-class system in the Galena Lodge area," he said. "We have the opportunity to do something really good here. I hope people will come out and tell us what we need to know about it!"